We here at One Fat Frog always take the chance to try a lot of different restaurants in the area. Honestly, our business thrives as much on knowing the local restaurateurs and their establishments as anything else. So it’s always a pleasure to go out and try some place new and different. Yesterday, I took such an opportunity when I grabbed myself a late lunch from That Deli in Lake Mary. I was first intrigued by what I saw in the plaza’s marquee: “Wish That Deli Luck at World Food Champs in Vegas.” Yes, you saw that. Someone from our very own backyard in Central Florida competed in the World Food Championship in Las Vegas. When I asked how they did, I was told they got 15th. Out of about 300 competitors, including celebrities, that’s pretty awesome. 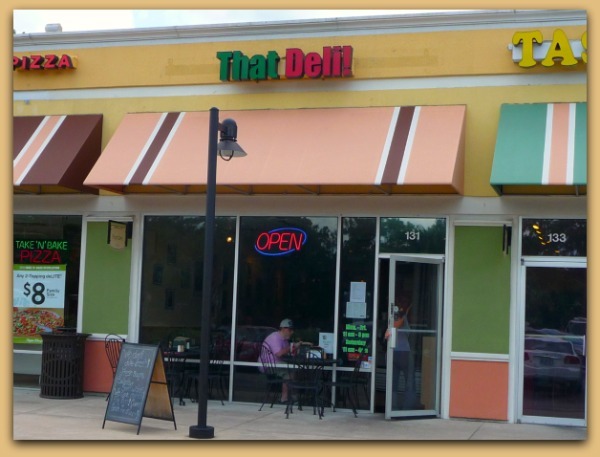 Plus they’ve been given the distinction of Best Sandwich in Orlando Magazine’s 2012 Dining Awards as well as second for Best Deli and Best Takeout, that’s pretty sweet. So yeah, you know it’s going to be good. Let me first remind that I’ve only been there once so far, but I can promise you I definitely will be back. They have new specials all the time that go with their usual menu, so it can take a while to try everything, but that doesn’t mean I’m not going to try. First, I had their cream of garlic and parmesan soup, and I am not exaggerating, but I’m pretty certain I saw life just a bit clearer with my first bite. Yes, it was that good. I continued to enjoy the soup while waiting for my sandwich, the Daytona Beef. Hot roast beef and provolone along with sautéed peppers and onions all on sourdough (my choice) bread. It was so good, it can be put in a sentence fragment and be fine. The main thought going through my head with every bite was a self-deprecating silent smack down on my conscious: “What took you so long to try this place?” It’s not often I willingly build up expectations like this, but there are few places that I think can rise to meet them, and That Deli is definitely the place. So do me (and yourself, really) a favor and go check out That Deli in Lake Mary. You can find them quite easily via their website, Google, Urbanspoon, or just follow the other deli food lovers you know since chances are good they’ve been there. And when you do, tell them the Professor said hello, congratulate them on their success at the World Food Championship, and tell them that I’ll be back to sample the next amazing meal soon.